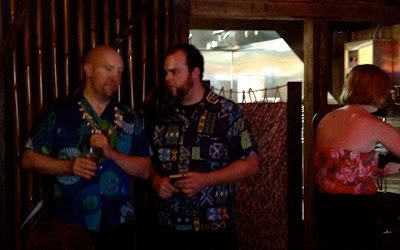 Earlier this year I was extremely disappointed to hear that one of my favorite watering holes, the tiki bar Thatch, was closing. However, I was quickly soothed when I learned that the space was being taken over by Blair Reynolds of Trader Tiki/B.G. Reynolds syrups fame. If anyone knows tiki, it's Blair, so I trusted him to do it up right. 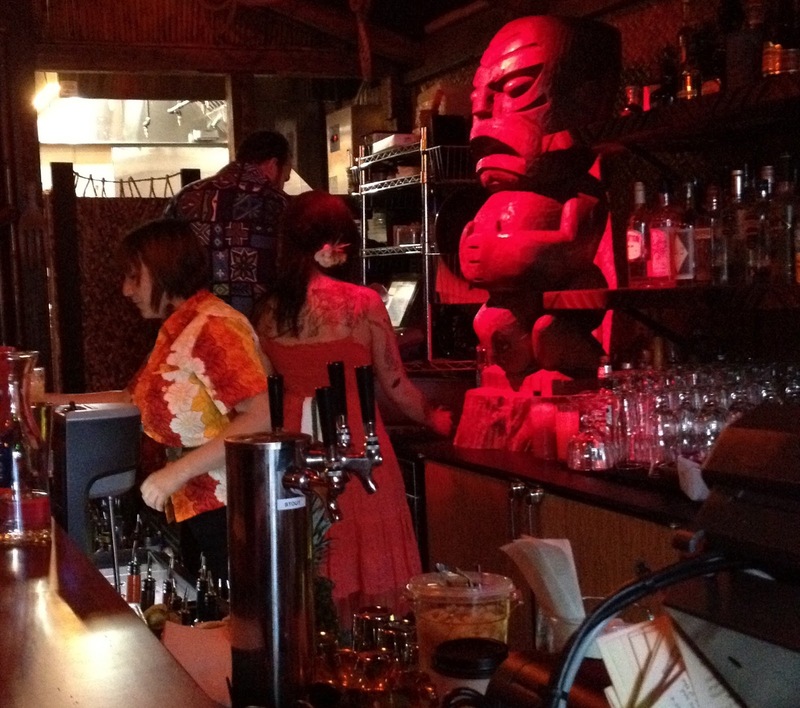 Last night was the opening night for Hale Pele, as it has been rechristened. Blair has kept everything done right by the former owners and added some nice new touches to the place. The ambiance is perfect, with the tiny bridge over a water feature ushering you into a tiki wonderland. I got to the bar about an hour after the doors opened and it was already packed to capacity. The space is relatively small, with about a dozen seats at the bar and maybe two or three times that many in booths along the opposite wall. The size seems to be about right, as more seating would definitely strain the abilities of the two bartenders behind the stick to keep up with orders. As a nice cameo, Martin Cate of Smuggler's Cove and tiki guru extraordinaire was there to help with the opening. Thankfully I was able to nab a seat in a booth quickly after arriving. I settled in and glanced over the well balanced menu to see what was available. 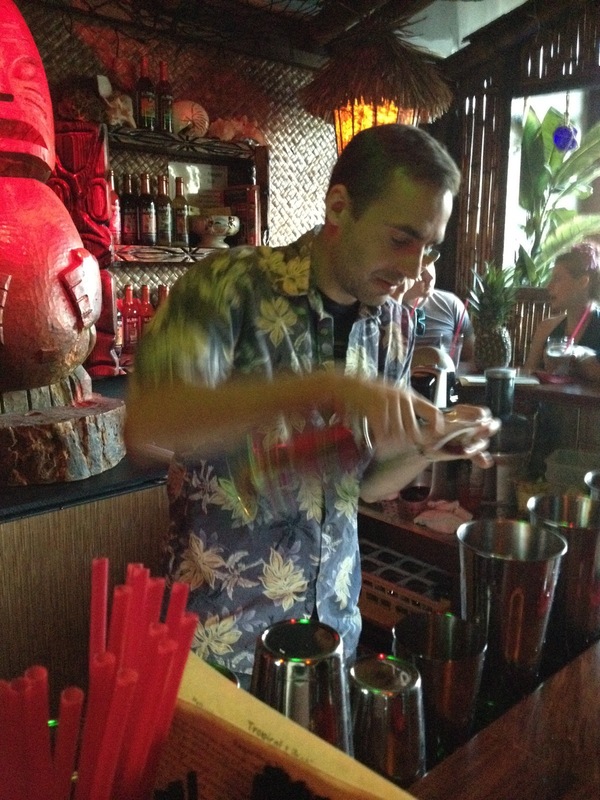 After a bit of thought, I ordered a mai tai (the true test of a tiki bar). While it took a little while to get my drink (they were swamped), it was worth the wait. Blair has gone for the most serious Mai Tai possible, a 1:1 split of Smith & Cross Jamaican Navy proof rum and St. James Royale Ambre rhum agricole. This is a very rum-forward mai tai and a force to be reckoned with. It actually reminded me a lot of my personal mai tai recipe, though even more amped up. While I only sampled a few of Blair's wares, looking over the back bar made me almost start drooling with the vast selection of rums and other spirits. There are some real gems on the top shelf, like Rhum J.M. VSOP and 1997, as well as a bottle of Clément XO that I really want to try. The people working behind the bar and the waitstaff did an excellent job given how full the bar was. Nathan and Mindy (I think that's her name) were putting out fantastic drinks along with Heather playing a bar-back roll (I think?). One sign of quality is that everything was being measured with Oxo measuring cups, meaning that the drinks were perfectly balanced and should remain so every time you order one. 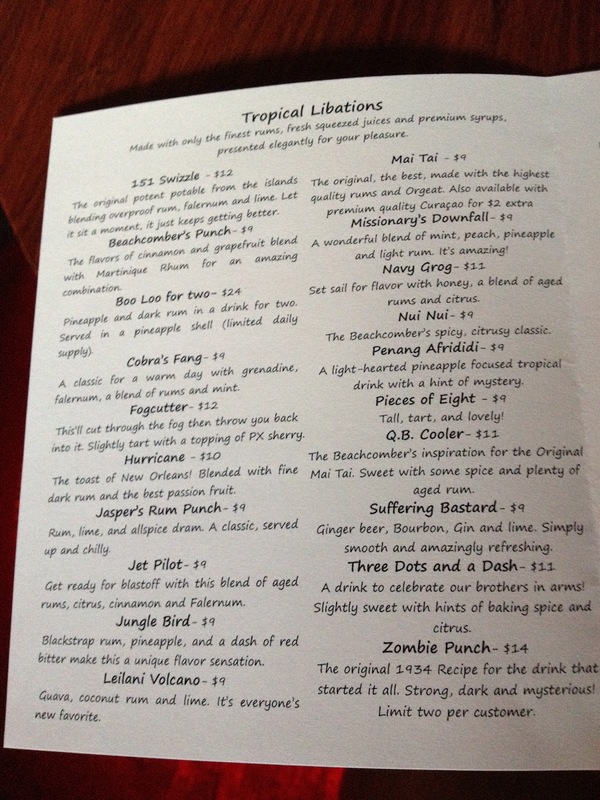 After the mai tai, I relocated to the bar and ordered a Jet Pilot. 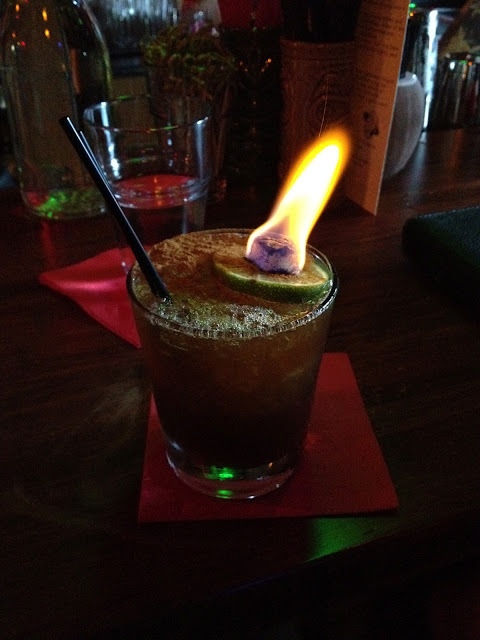 It showed up in 'reentry' fashion with a flaming sugar cube and a dash of cinnamon to give it real pyrotechnics. The drink was easily as good as the one I got at PKNY a few years back and half the price. It had a really excellent balance, with the strong flavors of Lemon Hart 151 just edging out the sweet, spice, and sour elements of the drink. They also have their blender technique down proper, as the drink started out strong to remind you just how much rum is in it, while retaining solid flavor as it was diluted by all of the crushed ice. I finally departed after several enjoyable hours and rode home in the cool of the evening. I look forward to many more trips to Hale Pele and seeing how the bar evolves over the coming years. If you're looking for an enjoyable place to get a drink in Portland, I would put Hale Pele right up the with the other mixology heavyweights of our fine city. 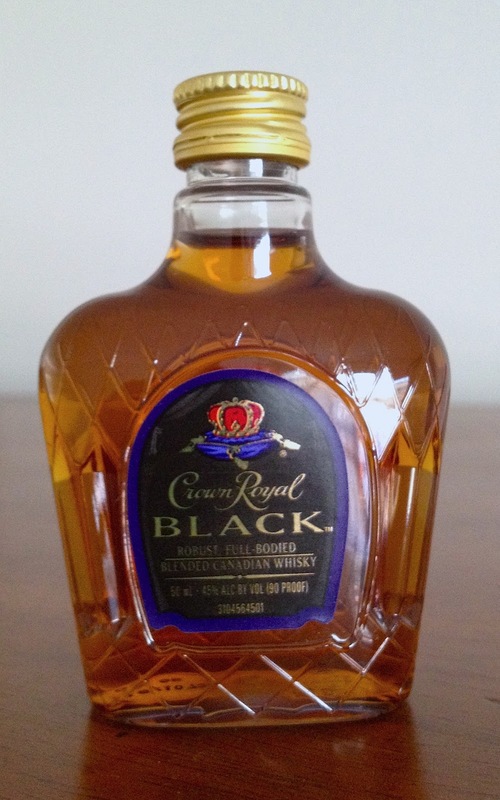 Crown Royal is one of the best known brands of Canadian blended whisky (Canadians use the e-less whisky spelling). The distillery was established in 1939 after a visit to Canada by the then King of England, George VI and his wife Queen Elizabeth. Located in Gimli, Manitoba, Crown Royal is put together from five different types of whisky that are all distilled and aged separately before being blended to form the various expressions. Three of the spirit lines are 'rye', one is 'bourbon' (presumably this means that it contains a mixture of corn, rye, and malted barley), and one 'corn' (my guess is mostly corn, likely with some malted barley). The 'corn' line comes off the stills at very high proof - almost like vodka - and is aged in refill barrels to keep it fairly neutral. That is used as the 'base' whisky, which is then blended with more flavorful whiskies from the other lines. In terms of flavor, this whisky seems like a mashup of some light grain whisky with a molasses-heavy Cuban style rum like Ron Matusalem. The use of refill casks really shows as there was a surprising lack of oak tannins in this whisky. Which makes sense, given that they're aiming for a lighter flavor profile. While I'm not sure this is something that gets me really excited, it does accomplish their goal of making a distinctly Canadian whisky with fairly robust flavors. However, it sounds like the feelings of long time drinkers are a bit more mixed. Taste: mildly fruity up front, segues into creamy grain, some pepper near the back, a bit of chocolate and bubblegum flavor. After dilution, there's more body and sweetness up front, but the flavors become flatter, with with pepper and bitterness near the back. The first time I tried this whisky, I made the mistake of tasting it immediately after the Black. While it holds up on its own, it didn't stand a chance against the heftier Black and seemed tepid and washed out. Sampled first it shows a much more robust and pleasant character that offers a different side of Canadian whisky - while lighter, there are more fruity and floral notes on the nose and palate. While I think it too could benefit from a higher bottling proof, that's not really Crown Royal's goal and it seems that they keep their customer base happy with a gentler spirit. Overall I would say that this is a very nice sipping whisky when you want something tasty but not overly complicated or challenging. The only major downside I can see is the price point, which sets it up against a lot of good single malt whisky. If you want something similar but a bit cheaper, Bushmill's Black Bush might be a good pick. Berry was able to determine that #4 was cinnamon syrup via one of Don's early bartenders, Bob Esmino. However, #2 eluded him until he eventually sussed out that it was a 1:1 mixture of vanilla syrup and allspice dram. 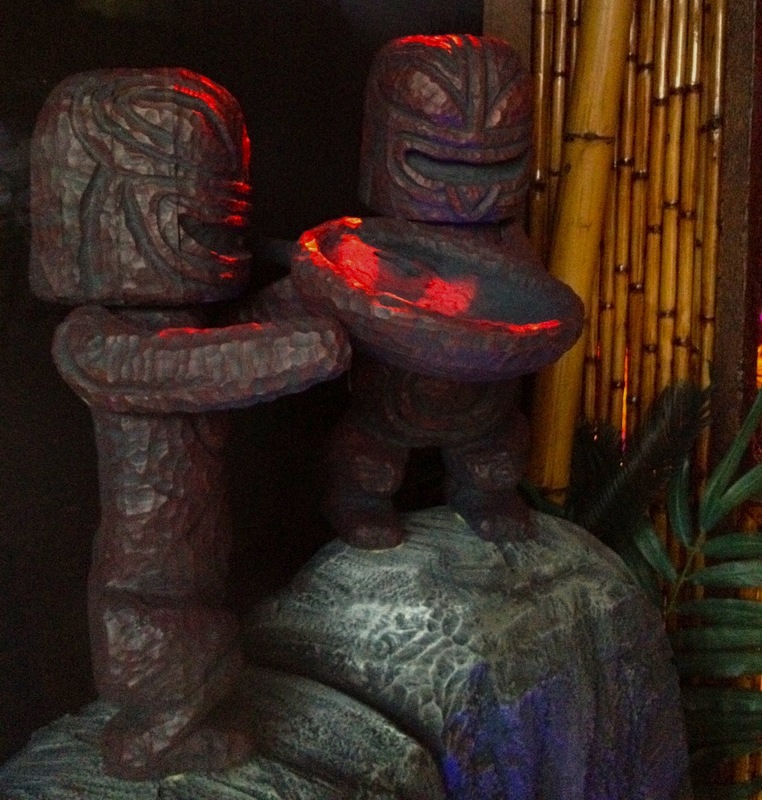 With that information in hand, the secret to the Nui Nui was finally unlocked. The nose is dominated by orange peel and rum. The sip starts smoothly from the sweet vanilla syrup, then transitions into citrus from the lime and orange juices, finishing with a bit of spiciness from the cinnamon syrup and allspice dram. Underneath it all, the rum provides support. For appearing to be a relatively straight-foward drink, this one is a bit tricky. Specifically, it requires the right rum. Cruzan 2 Year is my go-to for this drink, but I hear that Don Q Añejo and Mt. Gay Eclipse also work well. I've tried it with a few other amber rums, but for whatever reason the drink just didn't come together with otherwise stand-up rums like El Dorado 5 Year. If you want to bump up the sweetness of this drink (I know I used to, until my palate changed a bit), bumping up the Don's Spices #2 is probably the best bet, as the vanilla and allspice will counterbalance each other fairly well, though if you have really strong vanilla syrup it can get into orange creamsicle territory. The history of Maker's Mark goes back to 1954 when the distillery was founded by William Samuels Sr. with the first bottle coming out of the plant in 1959. While the brand remained under family ownership until the early 1980s, it then passed through a number of hands before settling under its current owners, Beam Inc (via the now split Fortune Brands). There are two main things about Maker's Mark bourbon that stand out - that it was the first brand to sell itself with the 'small batch' moniker (definitions vary, but MM has stated that they aim for batches of ~20 barrels) and that they are one of the few bourbons made with wheat as the flavoring grain rather than rye. The whisky (they use the spelling more traditionally used by scotch and Canadian whiskies) is bottled at a very respectable 90-proof with their trademark red wax seal. Nose: mellow corn, sweet vanilla, some toffee/caramel, woody cinnamon, a hint of fruit. After adding a couple of drops of water, the whisky acquires a slightly artificial cast, with bubblegum sweetness and deeper vanilla notes, along with a tiny puff of wheat and raspberries, while the corn still peeks through and more oak emerges. Taste: opens with mild sweetness and slightly thin flavors of corn, which carry through the palate, mild oak appears part way through, followed by a blossom of vanilla and dry cacao with a small prickle of pepper near the back. After dilution, the opening sweetness becomes somewhat cough syrup flavored, while the other flavors become somewhat flatter, with more bitter oak coming out at the back and continuing on into the finish. Finish: corn, mild oak, very little burn, slightly bitter and peppery. After adding water, the cough syrup/bubblegum flavors come back in the finish. While I don't find it to be a terribly compelling bourbon at this point, I do have to acknowledge a small debt to Maker's Mark. Back when I was an undergraduate, my college would regularly have a week or so during winter break when students and faculty could teach classes on just about any subject they liked. One student decided that he wanted to do a bourbon tasting. Out of curiosity, I decided to attend. Unfortunately I had almost zero experience with neat spirits at that point and most of the whiskeys just tasted like burning. The one exception was Maker's Mark, which was noticeably smooth and palatable, even after almost half a dozen, often barrel-strength, bourbons. It nurtured a small flame that I might actually like whiskey, though it took many more years before that dream was realized. So ultimately, even though I think I'll be sticking with Weller Antique for my wheated bourbon needs, Maker's Mark has its place. Their bourbon is almost the definition of smooth, gliding across the tongue with barely a bump. Just don't add any water if you want the best of what Maker's has to offer. If you're trying to introduce someone to bourbon who tends to prefer smoother whiskeys, this isn't a bad place to start. But once they've dipped their toes in, there are all sorts of more interesting bourbons to choose from. One of the things you realize fairly quickly after becoming interested in cocktails and spirits is that it can be rather frustrating to find everything you're interested in. Almost every country on earth seems to have some maddening law that makes getting your hands on that one last piece you need for the cocktail you read about or the latest fantastic spirit release. While Oregon liquor stores have a fairly good selection for being in a pseudo-control state (and have the small advantage of being able to view almost all of the stock within the state via Oregon Liquor Search), I'm not willing to buy an entire case whenever I want to special order something. So what are you going to do? Personally, I often turn to ordering online. Sadly liquor laws are absurd and that's not possible in every state in the U.S., but a decent chunk of the country is safe. Here are the online liquor stores that I have personally dealt with and can vouch for having good customer service. Note, I have not received any compensation for promoting these stores, I just want to bring more business to people who have treated me well. Hi-Time Wine - based out of Costa Mesa, CA, this was the first place I ever ordered from online. They have an enormous selection and often rather good deals. Shipping isn't too bad (at least if you're on the west coast) if you're ordering a few things at a time, usually run me $4-5 a bottle for a 4-5 item order. Service has been extremely prompt and nothing has ever been damaged in shipping, even when I ordered an entire handle of rum. DrinkUpNY - based out of Brooklyn, NY, I was initially drawn by the fact that the store had a deal where shipping was free on orders over $100. This helped to balance out slightly higher NYC liquor prices, so I was able to get some good bargains. However, that deal is no longer in effect, so shipping prices are now the standard UPS/FedEx rates unless you live inside the city. However, I can vouch for their extremely thorough shipping methods, which more or less guaranteed that nothing was going to break. As a nice bonus, they tossed in an issue of Imbibe for free. So while I'm extremely satisfied with the service I received from them, I have a feeling that the shipping costs will wipe out any savings I could get. However, if you live on the east coast, they're probably still a good source. The Party Source - based out of Bellevue, KY, this store is one of the few I've seen in the U.S. that regularly brings in lots of independent bottlings and its own private selection bottlings. They also have a vast selection of minis, which can be a good way to sample new spirits. They also sometimes have extremely good discounts on spirits, but you often have to act quickly as stock can be run down with surprising speed. I actually got pipped on one bottle in my last order, which must have been pulled off the shelf by someone before the staff could grab it for me. However, they did act very quickly to refund both the purchase price and the shipping costs. With all of that said, their shipping prices are, at least to me, very high. If you live closer it'll probably be a better deal, but it's difficult for me to get the price down much below $10 a bottle. Sometimes the deals are good enough that it doesn't matter, but it is a little hard for me to swallow when I can potentially get liquor from the UK shipped to me for roughly the same price. So while I heartily recommend them and have had nothing but good experiences ordering from TPS, be sure to pay attention to the shipping before you hit 'confirm' on your order. City Wine Cellar - based out of Staten Island, Ny, I bought whisky from this store for exactly one reason. They're the only place in the U.S. I've ever seen selling any of Diageo's 3x200 mL Classic Malts packs. As the alternative was buying them from the UK, I jumped on the opportunity. As they're in NYC, shipping was definitely a bit tricky to finesse, but I was able to find enough deals to make the numbers work out. Customer service was rather good, even when I was told that they were out of one of the whiskies I had ordered. I was able to make a substitution and everything ran smoothly from there. Packing was good and they were even nice enough to include the boxes that the scotch came in, which some stores won't do without any extra fee. 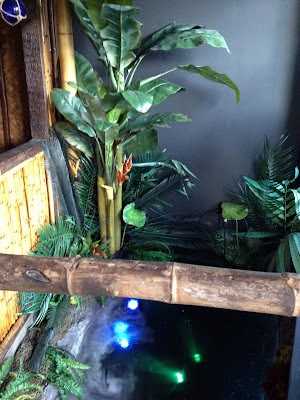 Overall a good experience and if you're in the NYC area, it's probably worth taking a peek. They do have some deals that would be pretty good with minimal or no shipping and also a slightly surprising variety of older Diageo releases (Rosebank 21, anybody?). Astor Wines & Spirits - based out of Manhattan, NY, this is where my most recent order came from. While they have a great selection and some decent prices, the shipping had always deterred me. However, they currently have a deal where shipping is free for first-time customers who sign up for an online account, so I was able to get some very nice prices without having to worry about any extra costs. Admittedly, this may be the only time I ever order from them unless their standard shipping ends up being not too bad, but it's worth taking a peek around their website right now to see if the free shipping is worth it to you. Much like TPS, their shipping on my order was impeccable, with the original packaging for all of my scotch included, plus individually wrapping both the bottles and boxes. Overall a very good experience. There are also a number if stores that I've had my eye on, but haven't purchased from before. I'd love to hear whether any of you have dealt with them before and what your experiences were like. Master of Malt - located in Royal Tunbridge Wells, UK, MoM is famous among scotch aficionados, especially for their Drinks by the Dram sample program. I'm particularly interested in them because of their reasonable shipping rates. The Whisky Exchange - located in London, UK, TWE has quite a number of the 3x200 mL Classic Malts packs that I covet, as well as one from Bowmore. Shipping prices seem to be a little high, but I might be able to justify an order. Are there any other stores you've had good experiences with? Let me know in the comments or on Twitter as I'm always on the lookout for new places that might have good deals or items I can't get elsewhere. 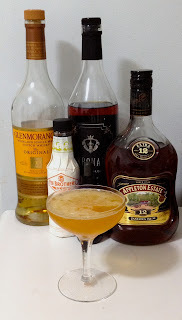 The Stormy Mai Tai comes from Guiseppe Gonzales, who revealed the recipe in Paul Clarke's post about the bitters-heavy Trinidad Sour, a drink that I reviewed a while back. Both of these drinks invert the normal ratio of spirits to bitters, using 90-proof Angostura bitters as a base spirit and liquor as an accent. Combine all ingredients, shake with ice, and strain into a chilled rocks glass full of cracked ice. Float 0.5 oz of light rum on top and garnish with a sprig of mint. The nose is pleasantly funky from the float of Banks 5 Islands rum, with some background spices from the bitters. The sip begins with pleasantly nutty sweetness care of the orgeat and orange liqueur, then segues into a briefly sour interlude of lime, quickly transitioning to massive spice flavors of cinnamon and clove from the Angostura bitters. 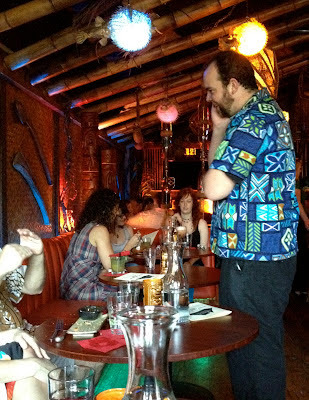 As the drink continues to dilute, the spice flavors become more integrated, spreading across the sip and joining up with hogo from the light rum float. 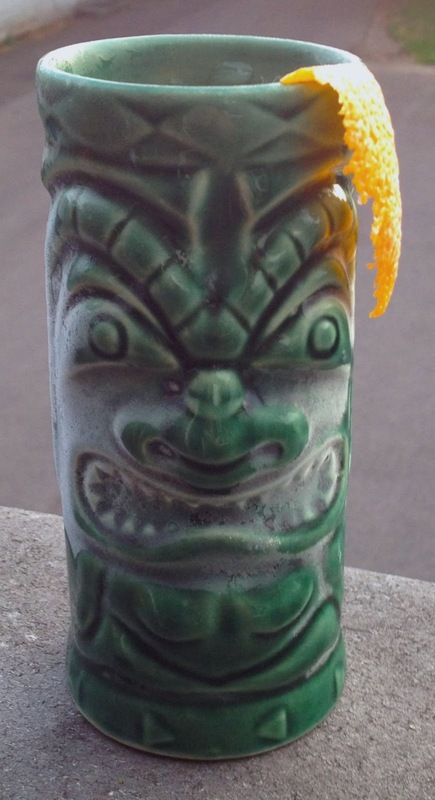 This may very well be my new favorite tiki drink. 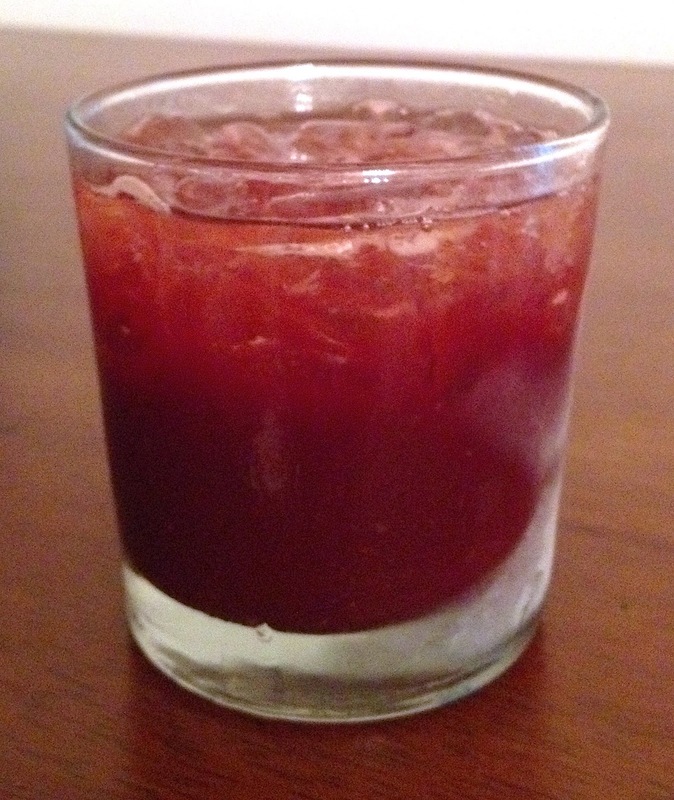 I think I'm going to have to stock up on Angostura bitters, because this is too delicious to not make again and again. While the flavors are massive, everything integrates beautifully, with tasty transitions that leave the finish pleasantly dry and more-ish. I'm a little bit sad that I didn't have any mint on hand to do this one up properly, but the choice of Banks 5 Island rum was a good choice, as it's hogo flavors mesh well with the Angostura bitters' spices. The combination of bitters and B.G. Reynolds' orgeat also give the drink an incredibly thick mouth feel, which is part of what makes this drink so great. Neisson is one of the newer distilleries on the island of Maritinque, having been founded in 1932 by Jean and Adrien Neisson. Still under family ownership, it remains the smallest distillery on the island, with an output of only 400,000 liters a year (for scale, Glenfiddich distills roughly 10 million liters of scotch whisky every year). Their rhum is produced from sugarcane grown on their own 40 hectares of land, with all of the cane cut by hand. Juice is extracted mechanically from the cane, then fermented for 72 hours before distillation. The wash is distilled in column stills to ~70% ABV as required by the AOC. Élevé Sous Bois roughly translates as 'raised in wood' and Neisson's ESB is aged for 18 months in large 20,000 liter vats (for context, a standard barrel used for bourbon or scotch is ~200 liters). This means that there is relatively little wood contact, so the edges are smoothed off the raw spirit without imparting too many woody flavors. The rhum is then brought down to 50% ABV for bottling. Nose: sugarcane, honey, a bit of vanilla and woody baking spices, green fruits (apples and pears), pineapple, funky esters, something reminiscent of a scotch whisky wine finish, red berries, cinnamon applesauce, vegetal, but overall a bit thin and somewhat sharp. After adding a couple of drops of water, the nose becomes reminiscent of a Speyside single malt, with more honied vanilla sweetness, while retaining some funky esters and vegetal grassy notes, overall becoming creamier but a bit flatter. Taste: only slightly sweet sugarcane up front, with a bit of sharp acidic attack not far behind, some woody bittersweet chocolate and nutmeg comes in with an almost malty creaminess mid-palate, while vegetal flavors build towards the back, where winey brandy notes emerge. After adding water, the palate becomes sweeter with less acidic attack, overall becoming flatter like the nose. Neisson's ESB is an interesting contrast to the Rhum J.M. ESB that I reviewed earlier this year. While I would give a bit of an edge to the J.M., Neisson's offering does have a few things to recommend it. The slightly lighter flavors make it a bit more approachable and the honied, almost sherried character really does remind me of a Speyside single malt like Balvenie Founder's Reserve, overlaid on the traditional grassy, vegetal notes of a rhum agricole. I'm a bit disappointed with the lack of finish and how much it loses after dilution, but I suppose there's a good reason why it's bottled at 100-proof. If you're a malt head looking to expand your palate to other spirits, this wouldn't be a bad way to dip a toe into the wild world of rhums. And while it's a bit on the expensive side for a rum, usually running into the mid-$40 range for a liter bottle, it's quite tasty and not too bad if you're used to single malt prices. This rhum is not best suited to a daiquiri, unless you like 'em really funky. The lime seems to bring out the vegetal notes more than anything else, while the sweetness struggles to keep up. There some nice barrel spice notes, though the finish is a little rough. Unfortunately this is why I initially wrote Neisson off, as I was only interested in making cocktails and the daiquiri was my method for judging rums. So it was relegated to the back corner of my liquor cabinet, until I became more acquainted with neat spirits and decided to give it another go. However, with a little work, I think it can be made to fit reasonably well into a cocktail. The nose is fruity, funky, and bitter, reflecting all of the ingredients in turn. 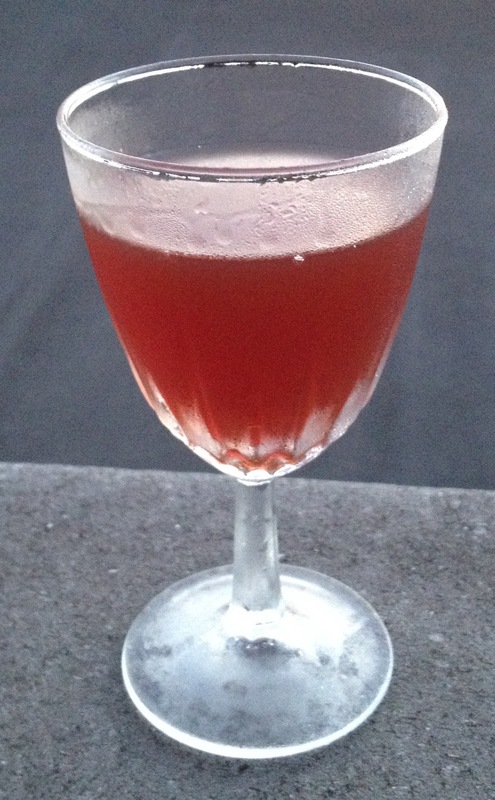 The rhum seems to drag out just a few more berry notes from the Campari and vermouth. The sip opens smoothly, but not exactly sweetly, segueing into the traditional Campari flavors, but with overtones from the rhum lifting the drink and adding some grassy funk near the swallow. The chocolate spiced rum isn't assertive, but adds just a bit more chocolate, spice, and pepper near the back. 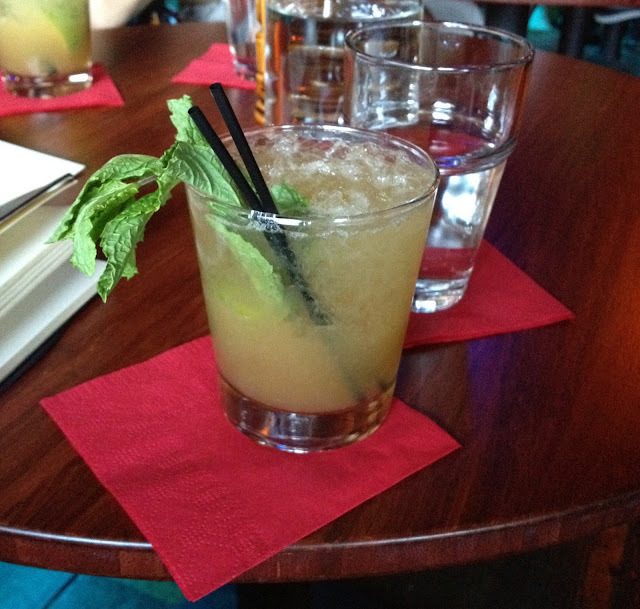 I snagged this drink from The Speakista, with slight modifications. I don't have any chocolate bitters, but the cacao nibs in my chocolate spiced rum seemed like a respectable substitution. Overall I think it's a good match for the Neisson, which is just smooth enough to blend harmoniously with the other ingredients. This whisky review comes care of a very generous sample from my friend Liz who still has a couple of bottles of this now defunct malt stashed away. Founder's Reserve was a 10 year old whisky that used to be one of Balvenie's entry level single malts. In contrast to their current entry level Doublewood malt, Founder's Reserve was a blend of whiskies aged separately in ex-bourbon and ex-sherry casks, rather than bourbon barrel matured whisky that was finished in sherry casks. Its entry level status meant that Founder's Reserve used to be quite the bargain, usually going for $40 or less. Nose: honey, fruity sherry, floral notes, lemon, malt, light vanilla, cinnamon and baking spices. After adding a couple of drops of water, the nose becomes more sherry-forward, with some dark chocolate emerging and the honey and floral notes gaining strength. Taste: strong honey up front, becomes malty with light vanilla, fades into sherry, pepper and pleasantly bitter burnt/caramelized sugar and coffee. After adding some water, the initial sweetness becomes more like sugarcane, with a slightly grassy note, and sherry becomes stronger mid-palate. Finish: becomes sweet again, with light brown sugar and a bit of sherried wood. After dilution, it becomes drying, more honied, with malt and bitter oak. This whisky reminds me favorably of Aberlour 12, though with a bit less sherry influence. This may be a result of the fact that they're both created in the same fashion, by marrying whiskies that were fully matured in either bourbon or sherry casks, rather than finishing bourbon cask whisky in sherry casks. I don't have enough data to say definitively, but I think I like that method better than cask finishing, as it lets both types of casks bring their own influences to the table, whereas cask finishing will sometimes overwhelm features developed during bourbon cask maturation. I've got to say that I like this single malt much more than Balvenie's now standard Doublewood. While I can't do a side-by-side right now, I feel like the Founder's Reserve has much more heft, even at the same relatively weak 43% bottling strength. Most notably, the honey and floral elements are much stronger, which lift the darker sherry flavors. I don't understand why Balvenie decided to drop this expression, especially as older stocks become tighter and some distillers are choosing to drop age statements entirely. At two years younger than the Doublewood, the Founder's Reserve should give them a little more flexibility to use younger stocks. However, it may be a case where they were running out of fully sherry cask matured whisky and needed to switch to cask finishing to keep up. Nobody by Balvenie knows for sure, but I would be quite pleased if they decided to bring this one back. It's a fantastic whisky and would make a great 'in' for people who are new to the Balvenie brand. As written in Ted Haigh's Vintage Spirits & Forgotten Cocktails, I've got to say that the Modernista is a hot mess. It's initially thin, then comes in with a confused mixture of flavors all at once, without the progression and integration of a well made cocktail. To top it all off, it leaves a rather unpleasant taste in your mouth. But I am nothing if not determined, so I tried to transform it into something more palatable, using the same ingredients, just with different proportions. Combine all ingredients, shake with ice, strain into a chilled cocktail glass, then garnish with a lemon twist. The nose is surprisingly well-integrated for having so many different strongly flavored ingredients. The lemon oils, orange bitters, and Herbsaint get together to make one particularly bright smell, which is backed up by the malty notes of scotch along with the funky/smokey elements Jamaican rum and Swedish Punch. The sip begins with reasonable sweetness, between the syrup, liqueur and maltiness of the scotch. This carries through to mid-palate, where the lemon comes in. Further back, the sweetness fades and the lemon dominates, modulated in a not entirely pleasant fashion by the tea notes of the Swedish punch and Herbsaint. The finish is still bitter and somewhat unappealing. I've got to admit that I have no idea what Dr. Cocktail was thinking with this drink. The pastis is completely out of sync with the other ingredients, marring what could otherwise be a fairly nice cocktail. While I tried valiantly, I don't think this one can be rescued. However, I'd love to hear from anyone who likes the Modernista as written. I'm curious if it's just my palate or if it's generally thought to be a flop. Opinions on the internet differ. After my latest sherry post, I decided to dive back into the world of sherry cocktails. This time I wanted to go for something with a bit more heft, which meant reaching for the oloroso. And figuring that rye whiskey might compliment it well, I went searching the Cocktail Database for ideas. Lo and behold, there were a handful of solid looking drinks to choose from. Just to keep things simple, all of these drinks were made with Rittenhouse rye whiskey and Lustau Don Nuño Dry Oloroso sherry. Oddly, this cocktail doesn't have any gooseberries to speak of. Sadly no info for how it acquired the name, but it's an interesting tipple. Despite using Rittenhouse rye, the nose is dominated by the dry sherry notes, with hints of lemon oil and rye grain. The taste begins with a mixture of rye and sherry, giving the sip an almost nutty quality. 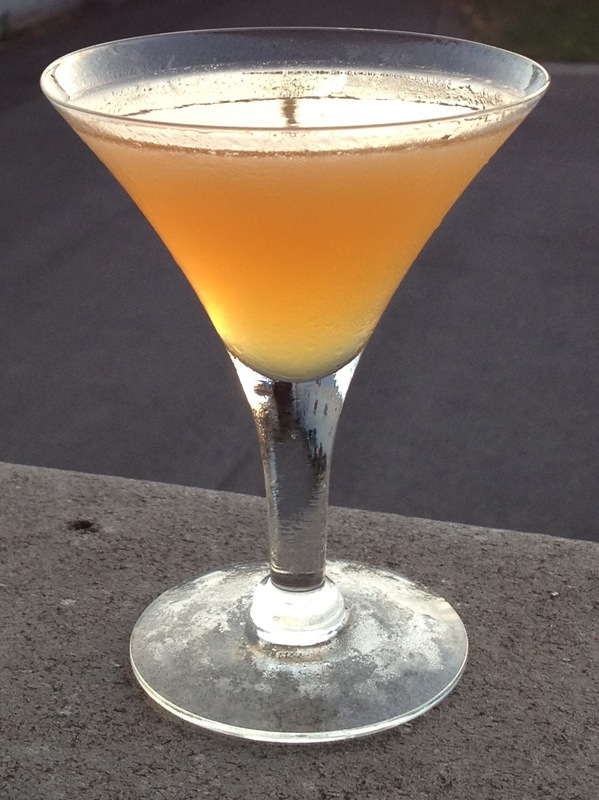 The lemon comes into force as the sip continues, just barely constrained by the simple syrup. It ends with crisp acidity, making my mouth water a bit. This is a bit of a peculiar cocktail, as the rye and sherry struggle to hold out against the lemon assault. It's definitely a drink for someone who likes their cocktails tart, though you can shift the balance by adding more simple syrup. It also gets a little less lemony as it warms up, especially on the nose as the rye grain becomes more prominent and the palate becomes just a bit sweeter. I think this would make a good aperitif cocktail as it's relatively light on the alcohol and definitely stimulates the salivary glands, leaving your palate cleansed and wanting more. 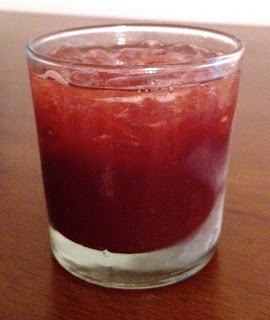 In other situations, I'd be tempted to up the amount of rye and sherry to make a more standard sour-style cocktail, but try it this way first. 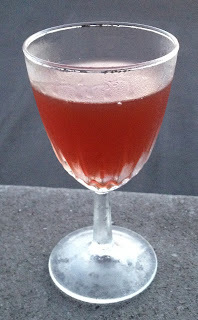 The next drink comes from Hugo Esslin's 1917 cocktail book Recipes for Mixed Drinks. An interesting name given that many of the ingredients would be thought of as fusty and old fashioned these days (though rye is making a comeback). However, I'd say this drink ultimately fits modern tastes just fine. The nose is full of the rye whiskey's grain notes, as well as Indian spices - cinnamon, tumeric, cumin - and just a hint of wine from the sherry. The sip opens with mild sweetness and orange notes from the liqueur, then transitions to rye and Ango bitters spices, finishing off with dry flavors of cacao and oloroso sherry. This is a really good cocktail. The combination of ingredients is far more than the sum of its parts, especially with the savory spices that are prominent throughout the drink. If you want something like a Manhattan, but just a hair sweeter, I would highly recommend this drink. 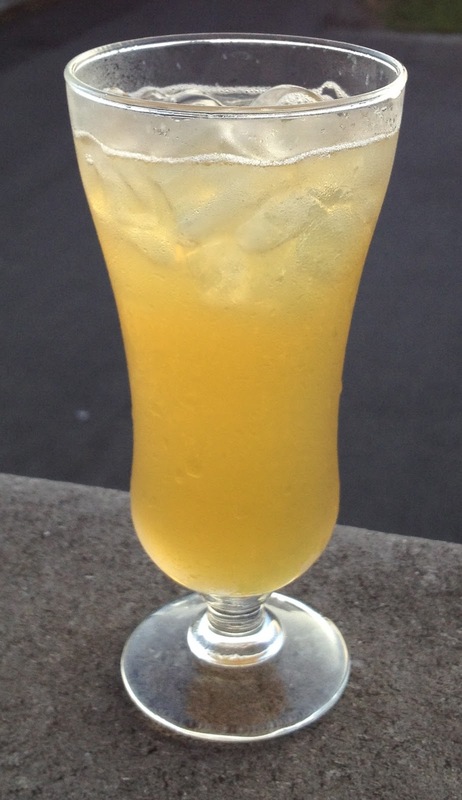 This drink comes from Patrick Gavin Duffy’s “Official Mixer’s Manual”. 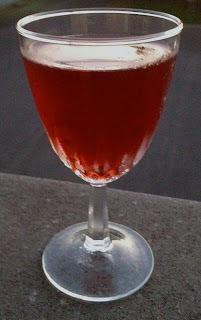 I agree with Erik Ellestad that this is a sort of petit punch, as it's rather light and not terribly sweet. I think you could batch it up to serve on a warm day when you want something lighter but not limp to serve. Combine all ingredients and add a couple of cloves and a pinch of chili pepper. Shake with ice and strain into a chilled glass. The nose is light - a spark of clove and a melange of rye grains and dry sherry, with almost jammy raisin and baked apple notes. This drink begins fairly tartly with a solid thump of lemon, followed by mellow orange, segueing back into a bump of rye graininess and tartness from the sherry, with another hint of raisins. The finish is almost all sherry, predominantly the yeasty flavors, with lingering hints of spice, especially from the pepper, which gives it just a small prickle of heat. This drink actually improves a bit as it warms up, with more pronounced spices on the nose and warm nuttiness near the end of the swallow. I used chipotle pepper in this one and I think the smoky flavor went really well with the rye whiskey. Overall I like how, despite everything else you're adding, it still retains a lot of sherry character, with flourishes of tartness and spices while remaining relatively dry. If you want a stiffer drink, it would also be possible to swap the proportion of rye and sherry to come up with something pretty tasty. 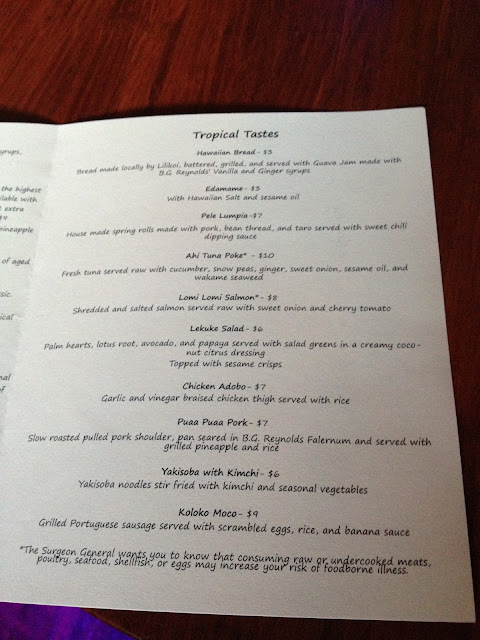 As you might have noticed throughout this post, Erik Ellestad has also covered a number of these drinks. He has a whole series of sherry cocktails, a number of which include rye whiskey, so head on over to Savoy Stomp if you want some more. This review also comes care of The Party Source's copious supply of miniatures. I was really interested to try this bourbon, because it gets rave reviews from so many bourbon drinkers. Woodford Reserve is the premium bourbon label for Brown-Forman, a drinks conglomerate that also owns such well-known brands as Jack Daniels. 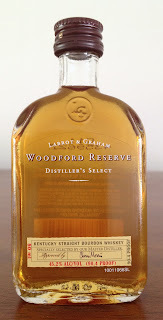 Woodford is nominally produced at its eponymous distillery near Versailles, Kentucky in what was formerly known as Labrot & Graham's Old Pepper Distillery, a location with history stretching back to 1797. However, its latest incarnation came about when BF repurchased the distillery in 1993, launching the Woodford line in 1996. This timeline suggests that at least initially, Woodford must have been created from whiskey made at other BF facilities, as NAS bourbons must be at least four years old. Woodford is made from a high rye mash bill of 72% corn, 18% rye, and 10% malted barley. As I mentioned, there's no age statement, but the whiskey is bottled at a very reasonable 45.2% ABV. Nose: lots of sweet aromas of butterscotch/toffee, bubblegum, and artificial sweeteners, along with some hints of vanilla, grainy notes of corn and wheat, herbal rye tang, musty oak, berries, and plastic wrap. After adding a bit of water, almost everything but the sweetness and oak are turned down, with more vanilla, some maple syrup and grape soda. Taste: initially there is a huge wash of artificial sweeteners, grape soda, and bubblegum, with flashes of citric acid (not fresh citrus), there's some rye pepper near the back, with a hint of orange peel. After dilution, the sweetness becomes even more syrupy, with more pepper, oak and some green wood near the back. Finish: pepper carries through, sweetness becomes even more unpleasantly artificial, with some stale bubblegum notes, leavened by a bit of oak. It's hard to describe just how unpleasant I find this bourbon to be. It's the first time I've actively disliked a whiskey, rather than just finding it uninteresting. The cloying, aspartame-like sweetness is extremely off-putting while bubblegum and grape soda notes just make me think of Dave Chapelle's sketch about grape drink (1:30 into the clip). The flavor isn't even grape, it's purple. It's hard to tell that this whiskey was actually made from plants, rather than having been concocted in a lab out of 'flavor chemicals'. The unrelenting sweetness would be much more tolerable if it just seemed to be real, like the caramel or maple syrup notes that one would expect from a barrel aged spirit. In the realm of confounding rather than bad, I also find it peculiar how little rye influence I get out of this bourbon. While I picked up a little bit on the nose, it seemed much more like a wheated bourbon. This is odd as the 18% rye in its mash bill pushes it well into high rye recipe territory and plenty of bourbons with a lower proportion of rye in their makeup have displayed much more robust influence. However, I guess that just goes to show how complicated the process can be. Mash bill matters, but there are ways to get around it. It's entirely possible that this is all just some quirk of my own sensory equipment. As I noted at the beginning of the post, quite a lot of people like this bourbon, though I'm not the only person to find it too sweet. But from where I stand, it's not something that I can recommend. If you really want to try some, get a mini or a pour at a bar before splurging on an entire bottle. I can only hope that your experience will be better than mine. 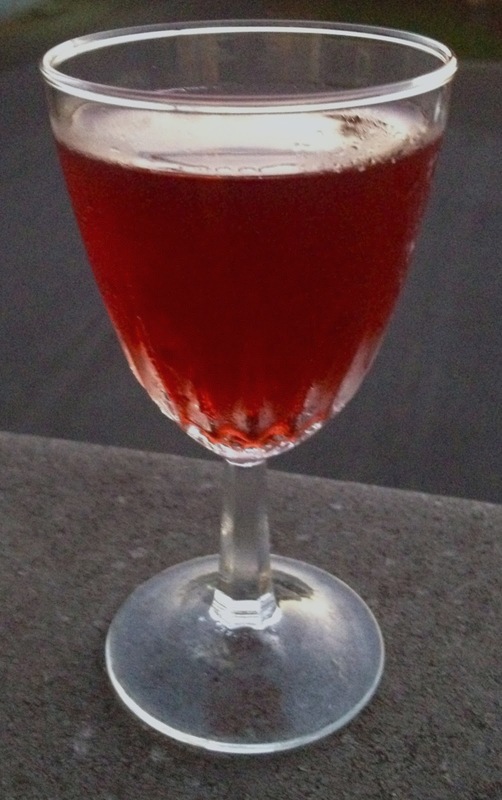 There are a number of different drinks with the name 'Imperial Punch', but this version comes from the CocktailDB - an invaluable resource when you have leftover ingredients and want to figure out what to do with them. Build over ice in a tall glass and top with sparkling wine, then stir briefly to mix the ingredients. The nose has subdued notes of prosecco with a hint of bourbon barrel and orange. The sip is initial crisp, from the prosecco and lemon, which is briefly smooth and sweet, then dries out again, finishing with the sparkling wine and bourbon. This is a nice medium weight drink. The bourbon gives it a little heft, but lengthening it with sparkling wine keeps it from being too heavy. Just keep in mind that you're drinking something that's mostly made of booze, so it can sneak up on you. Especially true if you're like me an prefer to make bourbon cocktails with 100+ proof whiskey. I went with Weller Antique 107, which makes for a very smooth drink, but a spicier bourbon like Old Grand Dad 114 could definitely give it a bit more pep. This is going to be the first in a series of reviews from minis that I picked up from the voluminous shelves of The Party Source. Seriously, if you want minis, they've got tons of 'em. I've reviewed a couple of Wild Turkey products before from their offshoot Russell's Reserve line, both the 10 year old bourbon and 6 year old rye. I liked the bourbon more than the rye, so this made me rather interested to try WT's higher proof Rare Breed expression. Since the minis were only $2.50 a pop, I got two, which means that I got to spend a bit more time with the whiskey than I usually do when reviewing from minis. Nose: light brown sugar with a burnt tinge to it, super smooth caramel, pastries, yeast, strong berries, a little grassy, vanilla, and some floral notes. After dilution, the nose becomes a bit mustier, with corn and grain become more recognizable, but not assertive, rich caramel and vanilla with a hint of rye. Taste: bubblegum sweetness with an acidic edge, kind of like raspberries or slightly under-ripe blackberries, then caramel or toffee in a dry-ish mode, segueing into big pepper, a bit of rye grain, and bitter oak. After a few drops of water, the taste becomes a little more subdued with less acid attack and slightly softer pepper. Finish: bubblegum returns under pepper and heat, with some caramel and berries. At times, this bourbon reminded me very favorable of a good single malt whisky, with the strong berry and floral flavors. However, while the usual caramel and grain of bourbon were someone reserved, it remained a distinctly American whiskey. The higher (54.1% ABV) proof is definitely present, but I feel like it's sufficiently balanced to not be a hindrance while drinking it straight. And if you do want to bring down the proof a bit, it doesn't fall apart like some whiskeys do. All in all, a really great effort from Wild Turkey. It's an excellent whiskey at a very reasonable price. Coming up, I'll be reviewing their standard 101 bourbon, so it'll be interesting to see how they compare.